The 49th NHK Taiga drama is Ryoma den, set back in the Bakumatsu period. 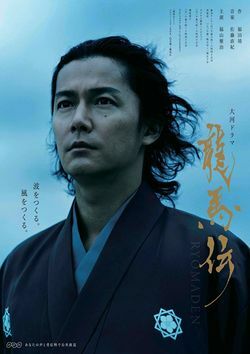 The story focuses on the life of Sakamoto Ryoma, who lived from 1835 to 1867. He was an important leader in the movement to overthrow the Tokugawa Bakufu, eventually bringing about the Meiji Restoration. He was also one of the founders of modern day Japanese navy through incorporation of western technology, which proved to be a force to be reckoned with during the revolution.